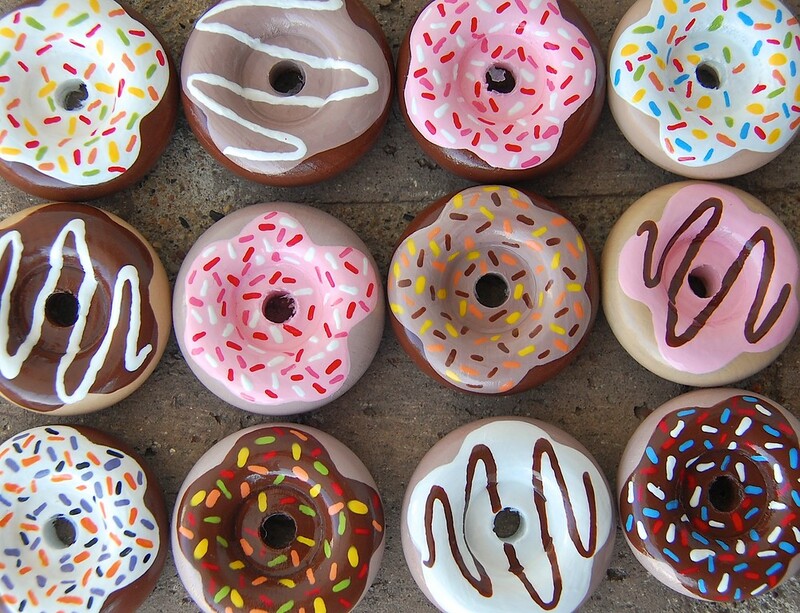 Yes, you could say I like donuts (or doughnuts, as I grew up spelling them). and for another, they're made of wood. 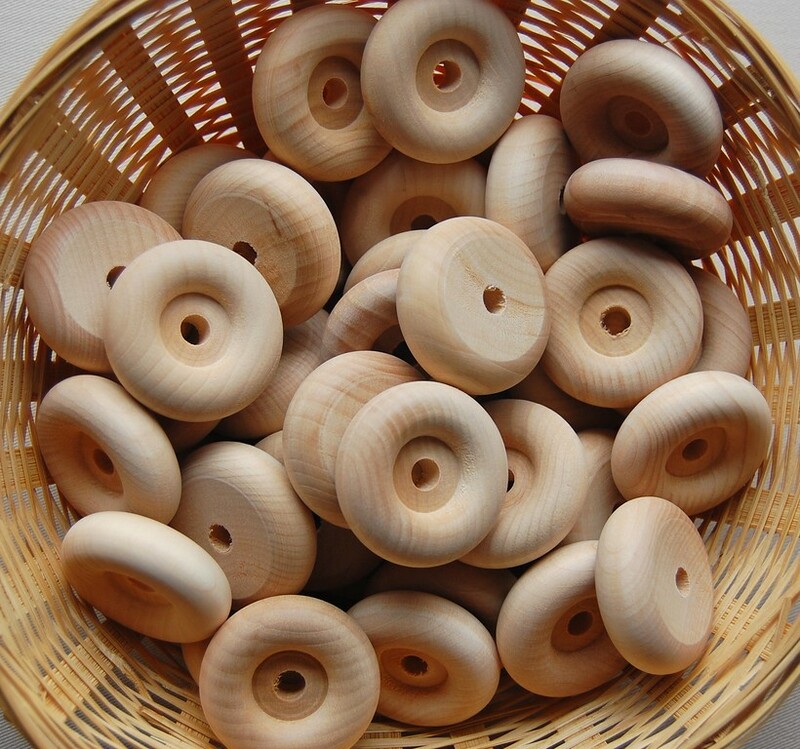 They're actually little wooden wheels! Who says wheels have to be stuck on vehicles? I bought mine here, where I buy all my wooden craft parts, including the blanks for my peg dolls and clothespin people. I buy them in bulk because I don't know how to buy just one of anything. The husband was away for the week, so we indulged in a craft that we knew would take that long. We had a lot going on that week, including chauffeuring various children to various educational institutions, playdates and recreational activities. So we did just a little each day, with plenty of drying time in between. 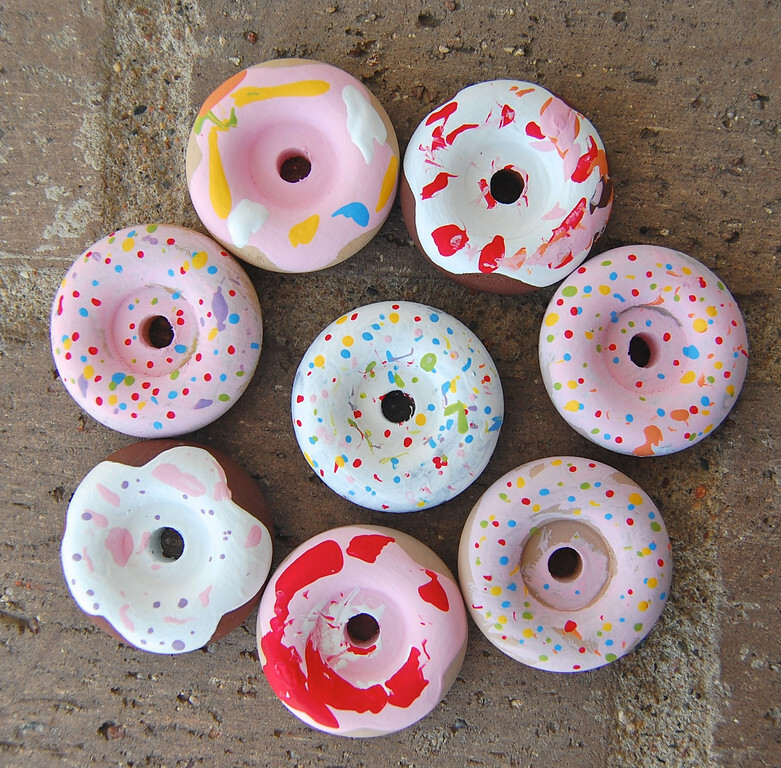 We painted the little wheels in shades of dough. We used acrylic paint. Notice the kids are dressed in very bright colors - they were instructed to choose their most lurid clothes to camouflage paint stains. 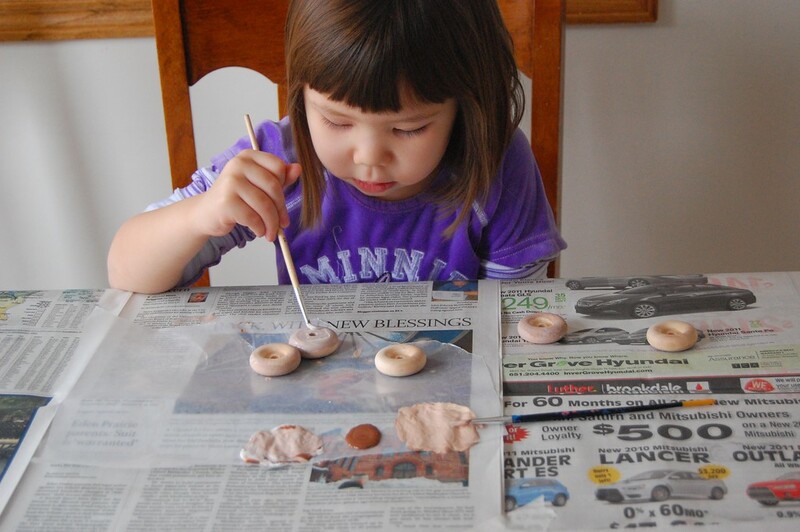 Two coats later, the wheels were left to dry overnight. 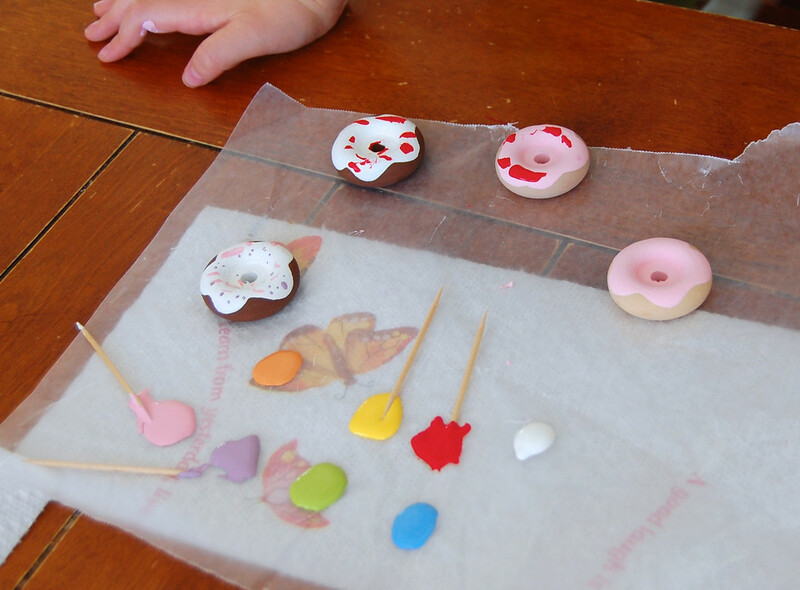 We painted on frosting - also two layers. This we did with toothpicks. Notice that we didn't actually use a palette. Instead, we used a sheet of wax paper over a padding of paper towels. 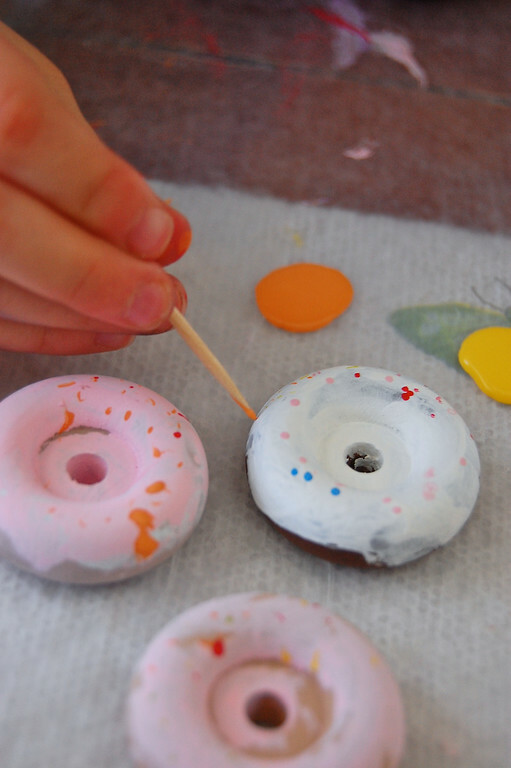 The wax paper is a good non-stick surface for the almost-dry bottoms of our painted items, and when the painting session is done for the day, everything gets crushed up and thrown away. Almost zero cleanup. These have nonpareils (or hundreds and thousands as I grew up calling them). Kate, Jenna and Momma did these in collaboration. 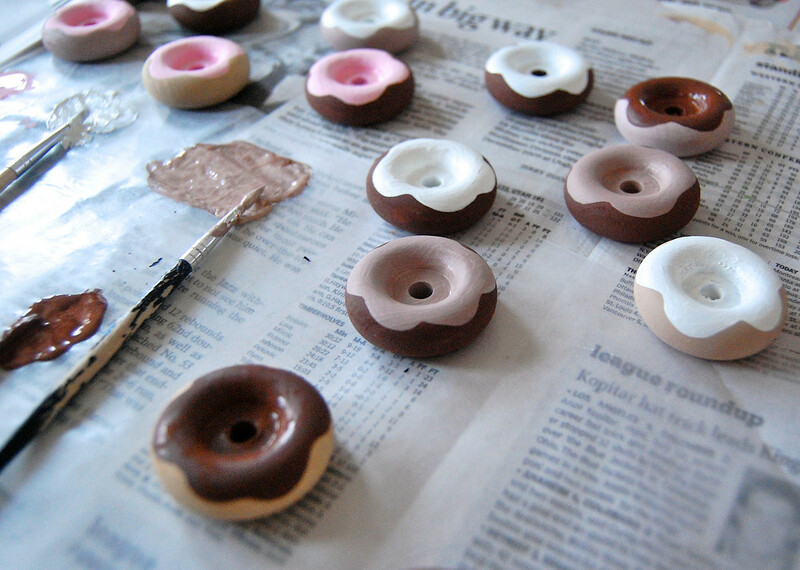 We varnished the donuts. This is what I used - you can get it at Michaels. Again, we did two coats. and we had a charming table centerpiece during the week. We made cardboard tiered serving trays. 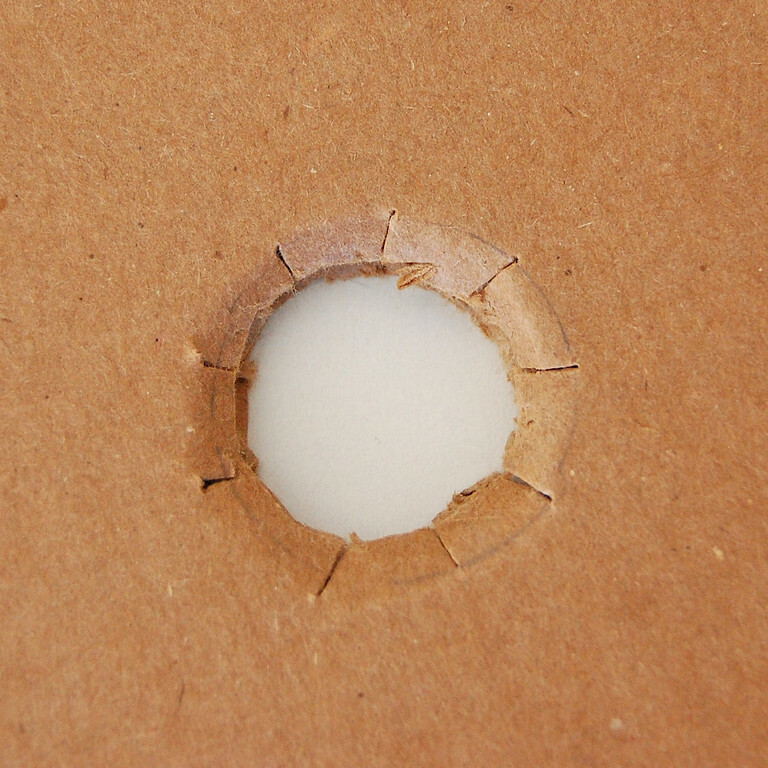 We cut two circles, one larger than the other. 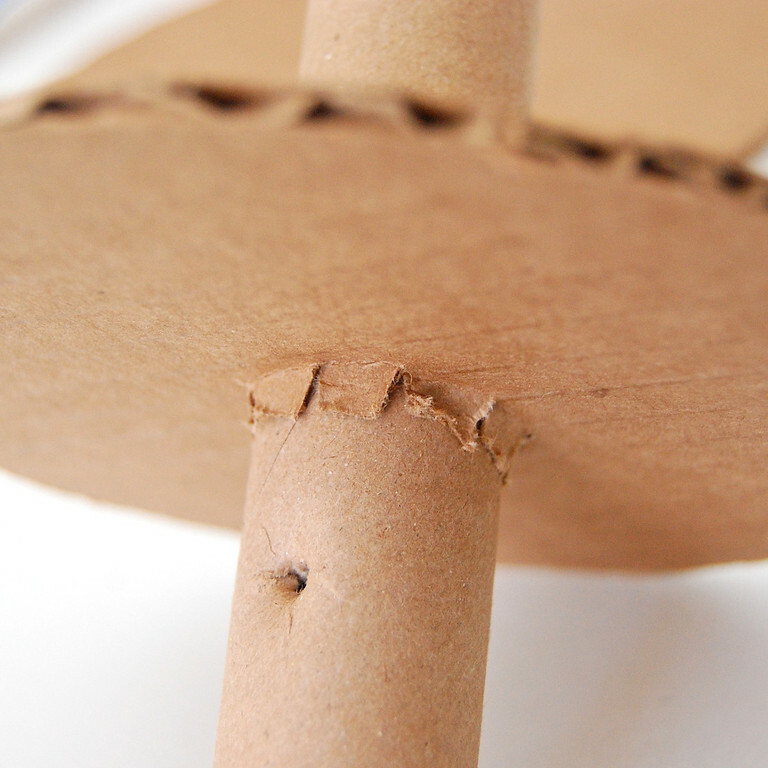 We also used a skinny cardboard tube, and a strip of cardboard for the handle. The dimensions are not important - it all depends on the size of the cardboard pieces you have available. 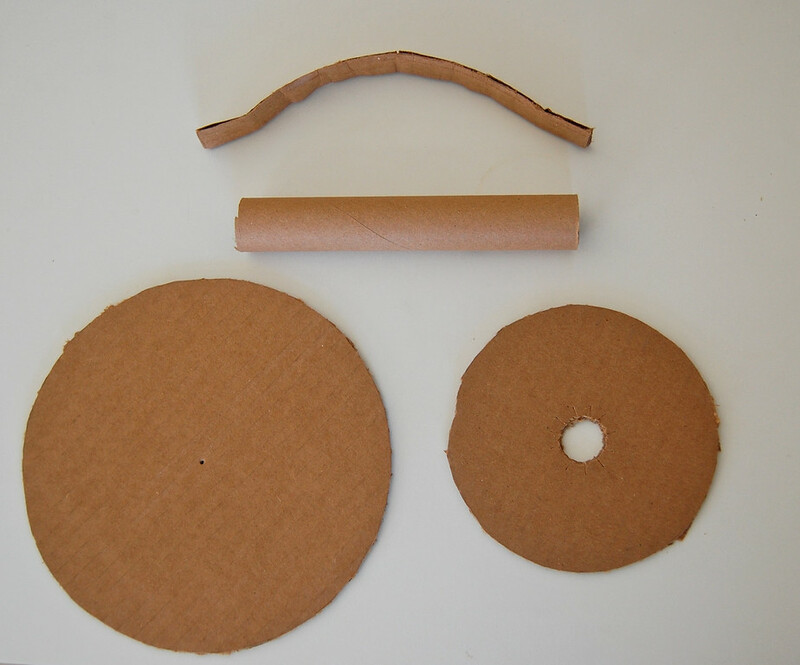 so that when the tube was inserted (left), the little tabbed collar could be glued on (right) to hug the cardboard tube. 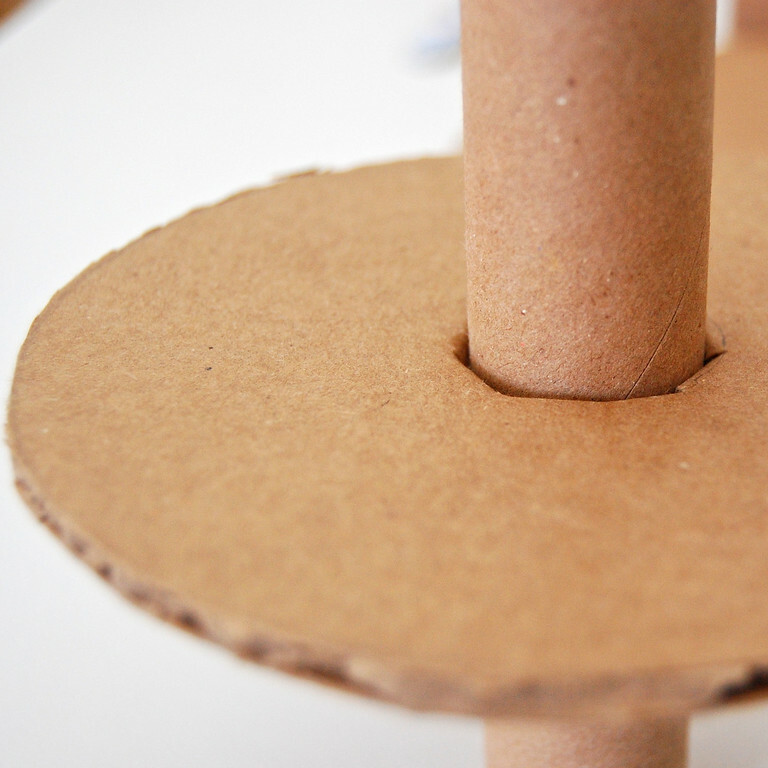 We bent the cardboard strip into shape for a handle and glued that into the top end of the tube. When everything was dry, we had a mini-tea party for dolls. 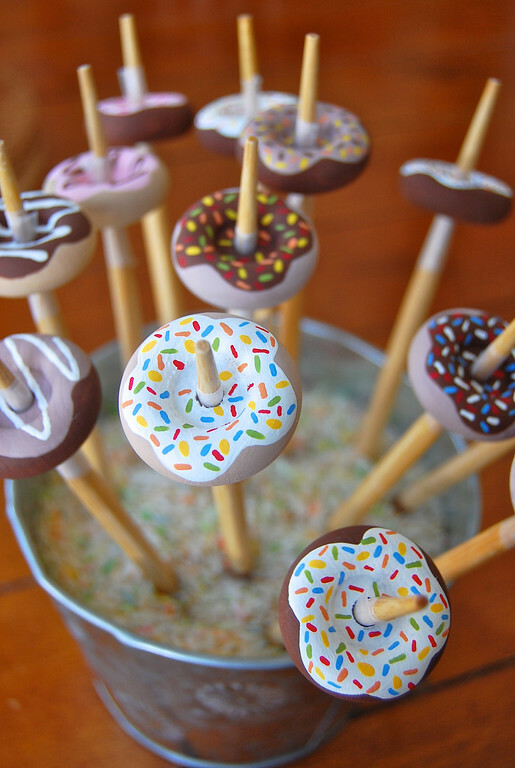 I love these donuts. 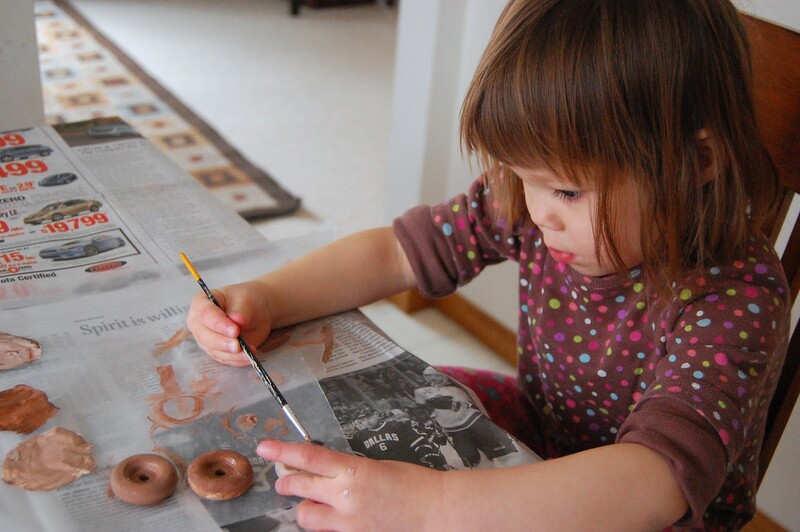 I am glad we bought a bag of 100 wheels because I think I am going to make more. And guess what - these come in a bigger size, too. And what about these for spice jars for a toy kitchen? And toadstools for fairyland? And trees for advent? And I must tell you how absolutely therapeutic it is to paint wooden things. Very calming to just sit, me and my toothpicks, and go dot, dot, dot. So much better than seam-ripping. 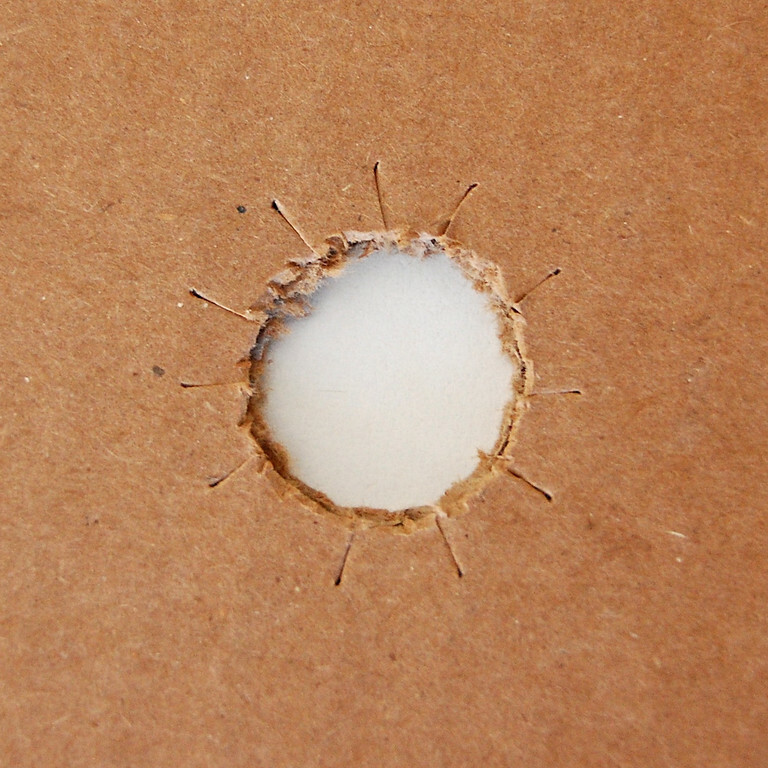 Cardboard and wood .......... is it any wonder that I'm not sewing anymore? P.S. Of course I'm still sewing, silly! Did you panic for a second? Hee. Absolutely brilliant!!! I love that you tapped into that cardboard stash too. So brilliant, as always! We call them hundreds and thousands too! I never knew they had another name! 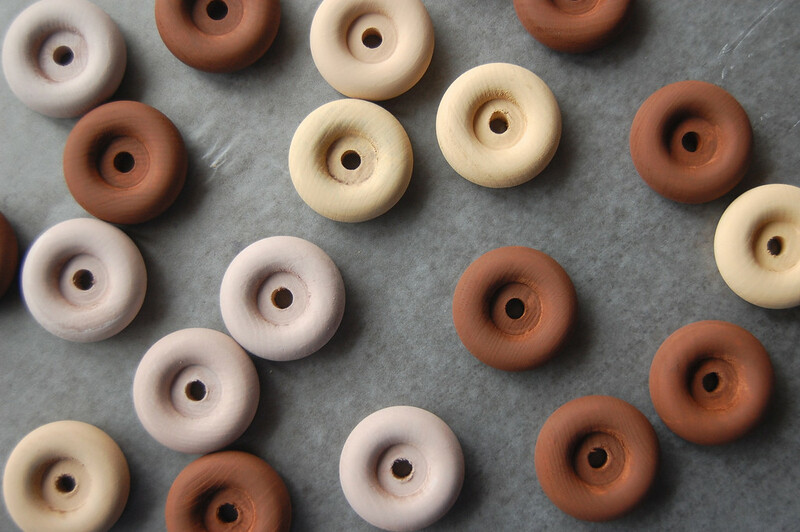 I just got on the computer to look up recipes for baked doughnuts (to top with the maple cream we bought last week, yum!) and your post was the first thing I saw in my Google reader... ha ha... but I love your doughnuts and especially the serving tray. Wow!!! what a fabulous project. So many great tips - chopsticks are so great for so many things (including eating!). 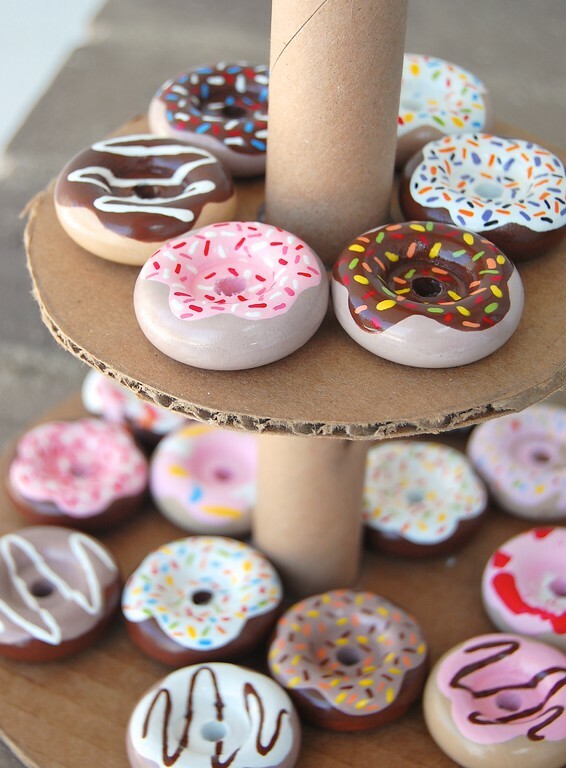 The donut stand is a perfect display. Thank you for sharing this wonderful project. Looks like your girls had a great time with this week-long extravaganza. "I buy them in bulk because I don't know how to buy just one of anything." Oh, is it a sewist thing? Why buy one when two will do? I love the serving tray! And am a little curious as to why you seem to have green & orange grains of rice - leftovers from a craft project? I really love your blog. Where do you find the time to do your every day things like -> meals, cleaning, loundry ...... ? Love these! You all did a beautiful job, too! 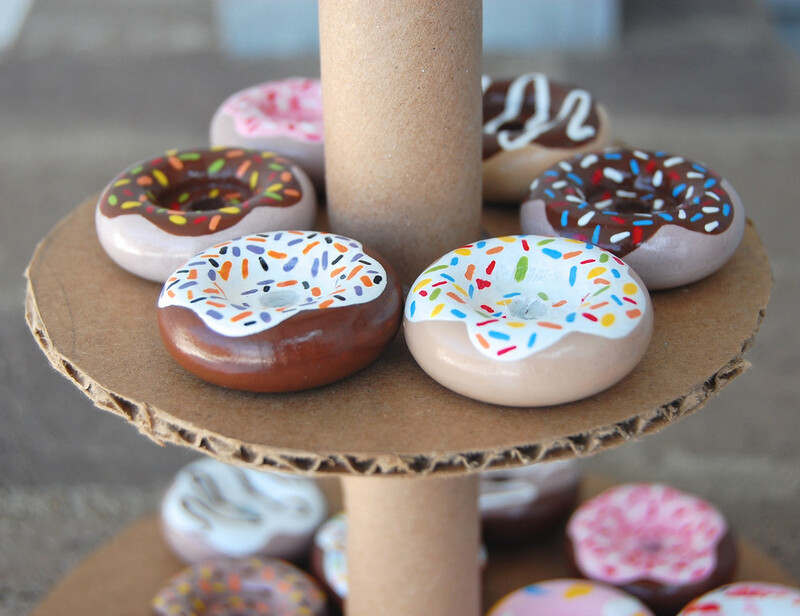 I make felt food for my 5 yr old daughter and these would make a nice addition to her refrigerator. Thanks so much for sharing. 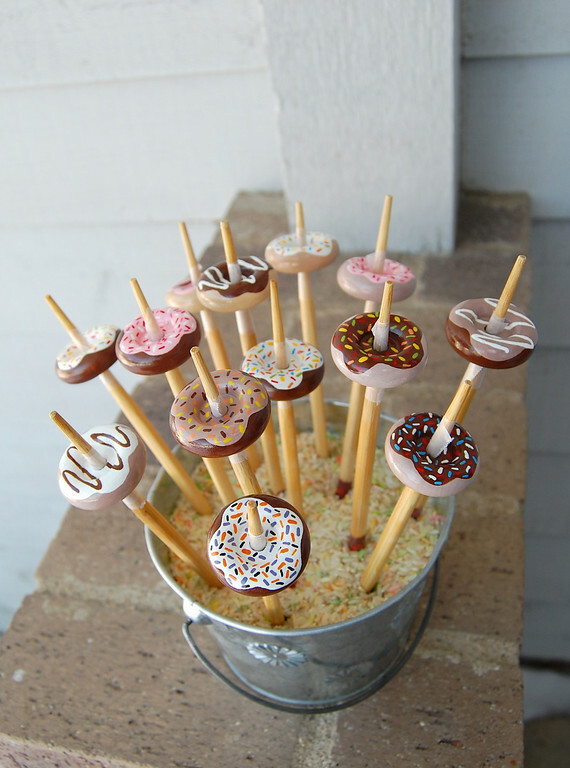 looks like delicious drop spindles! 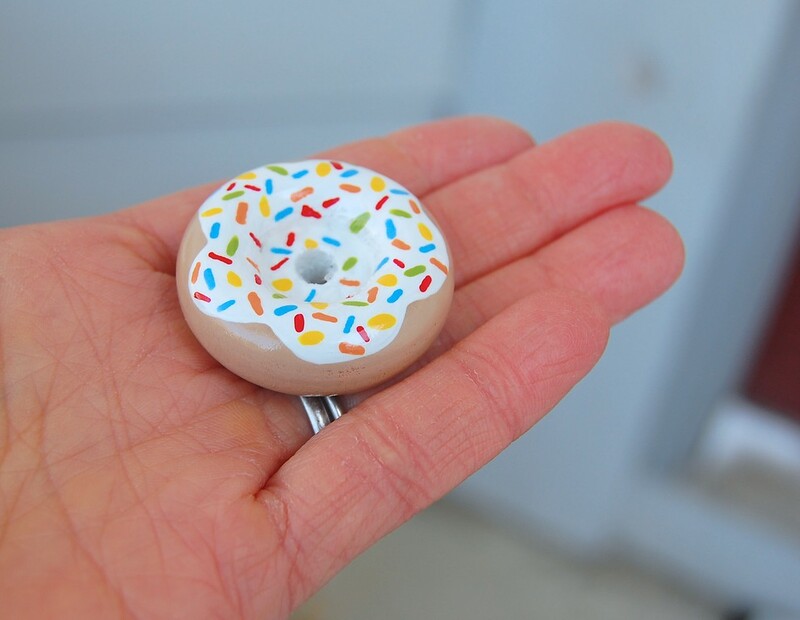 Owie doll sized donuts! Brilliant! I love the serving tray, too. And thank you for the link to the woodworks shop - I was wondering where to look for bulk-priced wooden items, and knew I'd seen a link on your blog somewhere but couldn't find it! Now I know where to shop! This are fantastic! 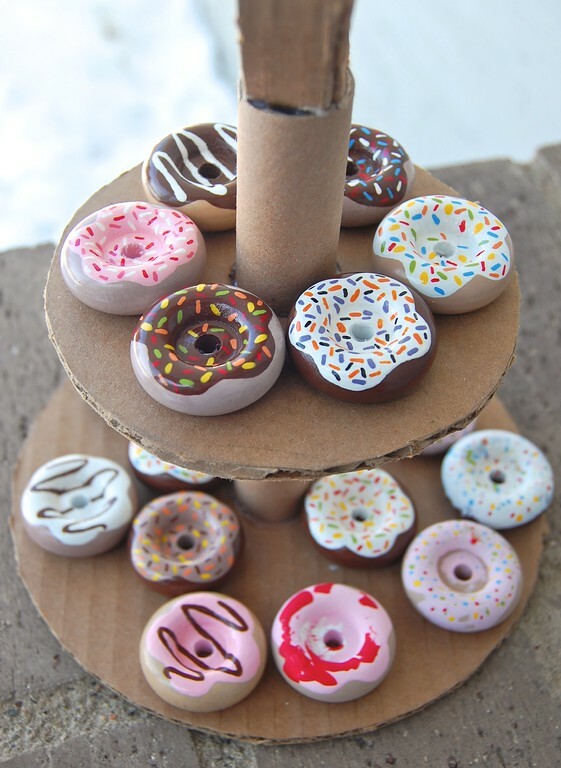 We use wooden stuff for all sorts of things other then their real purpose but I never thought doughnuts when I looked at wheels.With a bit of prep work this would make a fun birthday party craft. 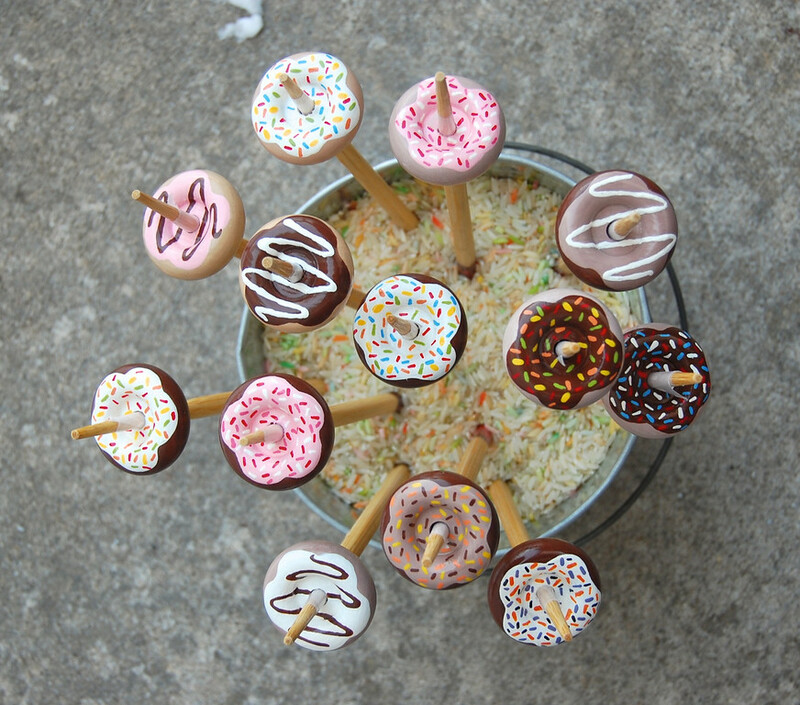 Just let the kids add the sprinkles at the begining of the party and let the doughnuts dry in the sun(I'm thinking summer here!). Of course you wouldn't be able to put the gloss on at the end but I bet the kids would have fun. 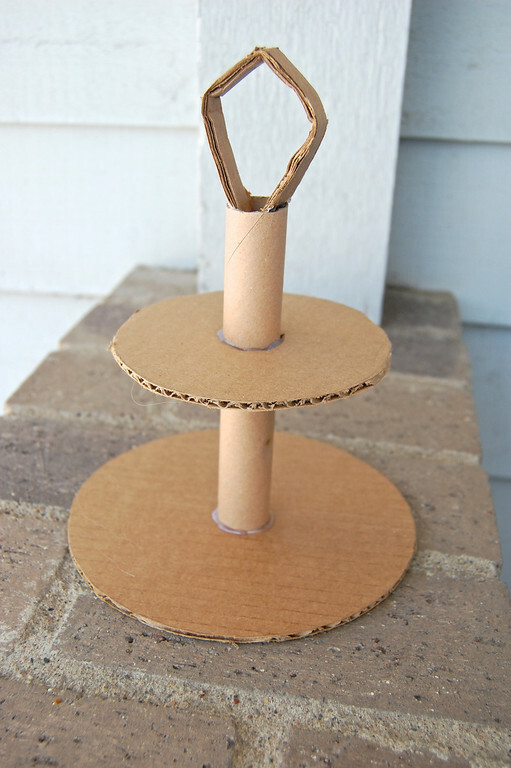 What a great party craft suggestion! And the paint dries quickly, too - within an hour, if it isn't too thick a blob. You know what, Millie? I only learned that name here in the US just recently when shopping for cake decor stuff. I now have an unwanted double vocabulary for many things, thanks to the British-US English disparity. I love this project! It's definitely being added to my craft to-do list. I love it! Simply brilliant! Hello. 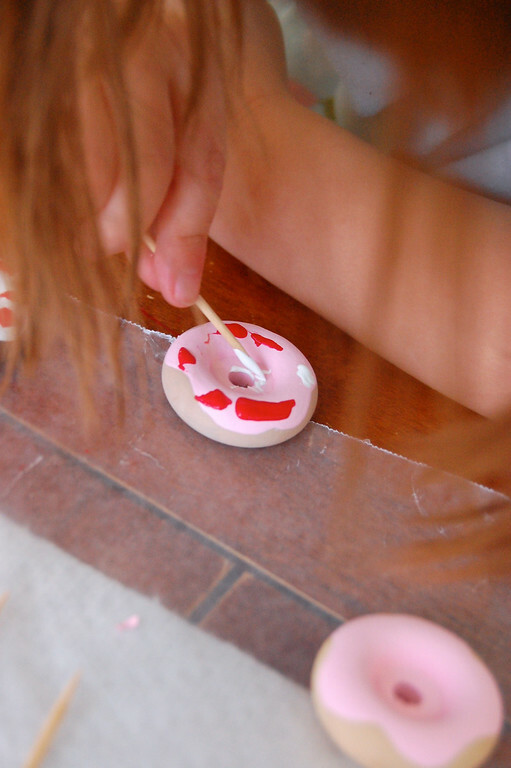 I saw this when I looked at google images of "pretend play donuts." My dad has wood working as a hobby and these inspire me to go pop into a favorite store of his to look around for inspiration!